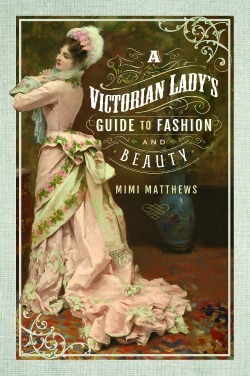 I like to make my historical novels as authentically Victorian as possible. However, when it comes to the subject of dental health, I’m guilty of fudging the facts. The truth is, not everyone in the 19th century had strong white teeth. Rather the opposite. In an era with no Crest Whitestrips, no veneers, and somewhat primitive dentistry, you were more likely to encounter a hero with brown or missing teeth than one with a gleaming white smile. When brushing, Victorians were advised to use castile soap, or a paste, powder, or liquid dentifrice. Dentifrices were widely available at local chemists’ shops. Some were flavored or scented with essence of roses, mint, or vanilla. Others were made from popular recipes, containing such ingredients as chalk, camphor, or quinine. The more abrasive the mixture, the better it was considered for the purpose of whitening the teeth. 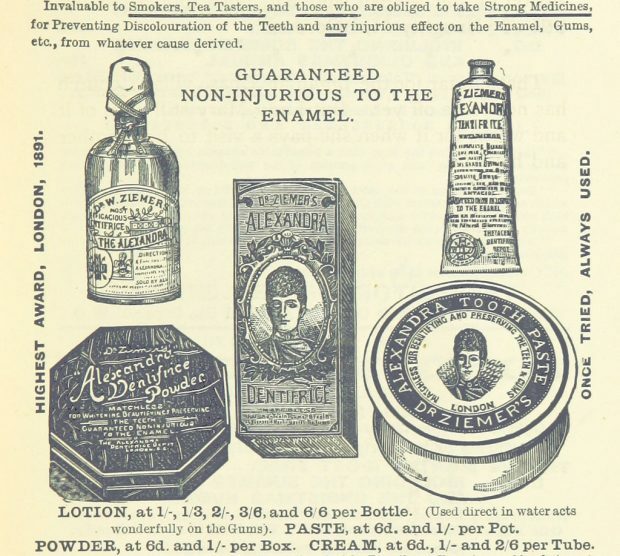 Dr. Ziemer’s Alexandra Dentifrice advertisement, 1894. 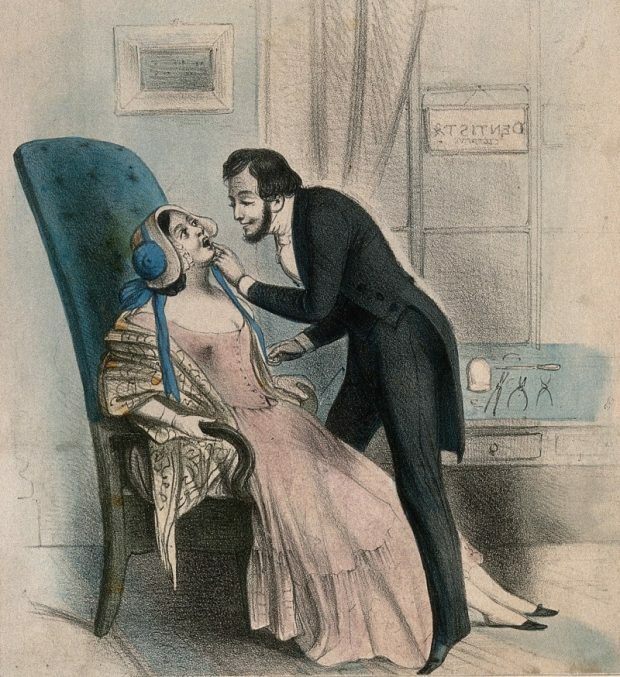 Many Victorian methods for whitening the teeth were less than ideal. Charcoal, ground into a paste, was one of the most popular of this variety. The 1860 edition of Mackenzie’s Five Thousand Receipts in All the Useful and Domestic Arts provides a recipe for a teeth whitener made of charcoal and honey. In the short term, such a mixture did a creditable job of whitening the teeth; however, in the long term, charcoal inflamed the gums and often led to periodontal disease. Bleaching was another option for whitening the teeth. Oxalic acid had been in use for just such a purpose from as early as 1830. Other methods of teeth bleaching involved the application of solutions of diluted nitric acid, chloride of soda, or cyanide of potassium. These solutions could be quite injurious to the teeth and any surrounding tissue, which was why it was recommended that they never be applied except by a qualified dentist. A nervous elderly lady in a dental surgery. Pen drawing by S. Wood (1870-1944). 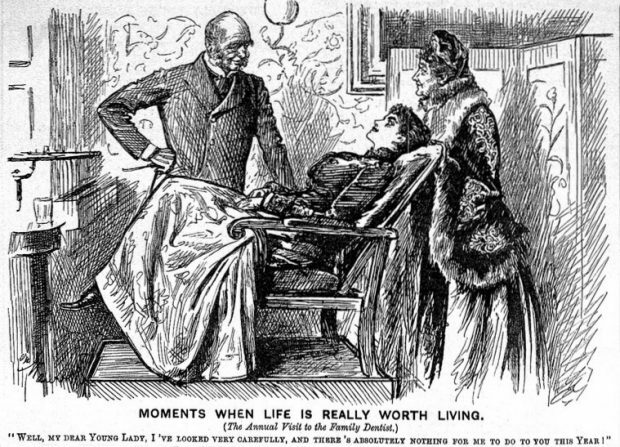 Caricature: Moments when life is worth living, Punch, 1891. Instead, Belgravia advocated avoiding all “pastes, lotions, and powders which profess to make the teeth white” and leaving teeth the color that nature had made them—even if that color was not as brilliant as one might desire. 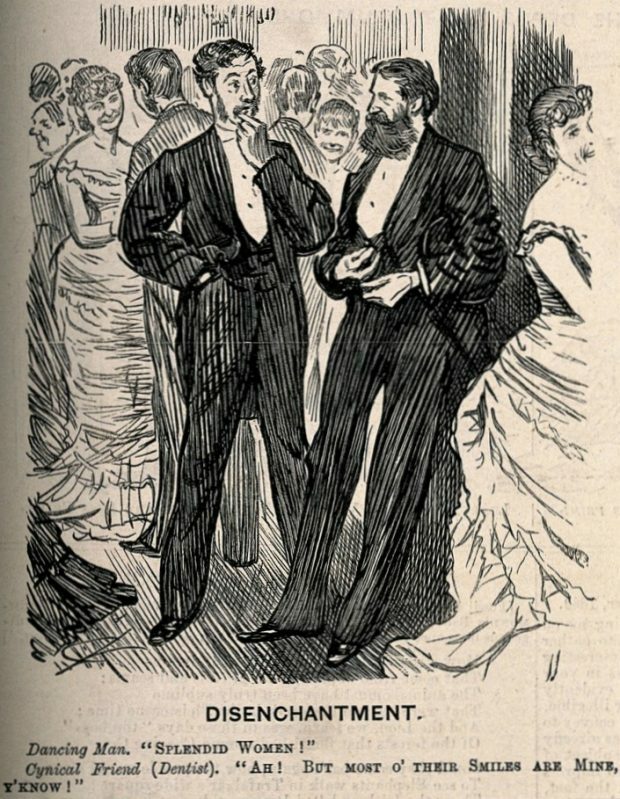 A man commenting on the beauty of women at a ball, his friend (a dentist) implies that the perfection of their smiles is due to him. Wood engraving after C. Keene, c.1882. Today, we know a great deal more about dental hygiene and we have countless ways to improve the appearance of discolored or damaged teeth. Still, I can’t help wondering if future generations will find some of our methods as barbaric and dangerous as we find those of the Victorians. What do you think? Belgravia: A London Magazine, Vol. XXIV, London: Warwick House, 1874. 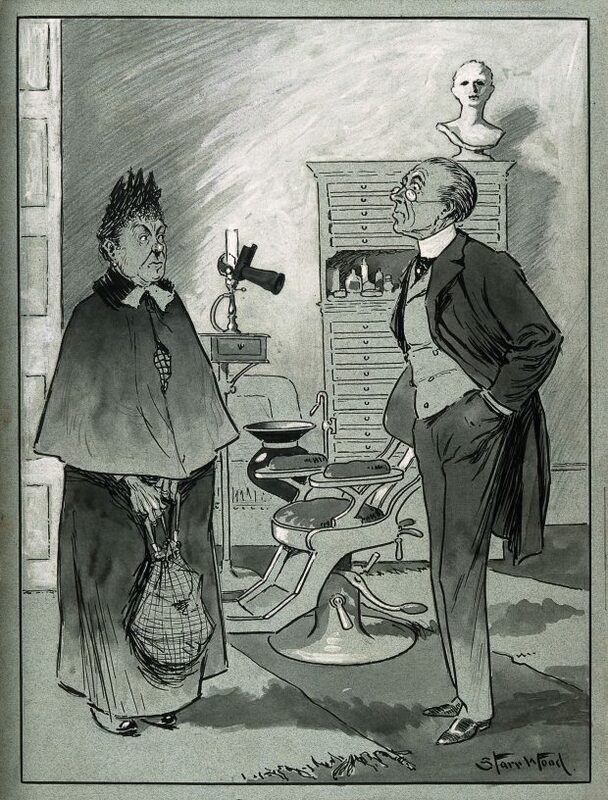 The Dental Review, Vol. VIII. Chicago, H. D. Justi & Son, 1894. Mackenzie’s Five Thousand Receipts in All the Useful and Domestic Arts. Philadelphia: Hayes & Zell, 1860. Meredith, L. P. The Teeth and How to Save Them. Philadelphia: J. B. Lippincott & Co., 1873. Smith, Mayo G. A Popular Treatise on the Teeth: Containing a History of the Dental Art. Boston: John P. Jewett & Co., 1848. You think of such interesting stuff to post here! I always hope everyone else will find it as interesting as I do! I’m glad you thought so! Wow!!! So glad we have moved on from these although I have to laugh at manufacturers using Princess Alexandra’s image to sell teeth whitening products!!! I know, right? It made me wonder if Princess Alexandra had particularly great teeth. Very interesting indeed, but thinking about it charcoal is still used in teeth whitenig ( Charcoal toothpaste) till this day but of-course it is safer and tastier hehe . Glad you liked it, Rym!